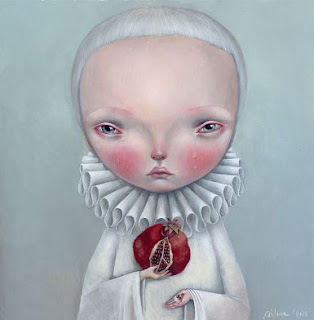 Dilka... Pomgranate (2011, Acrylic on wood). From the exhibition Italian Pop Surrealism: Birth Of A Nation at Mondo Bizzarro Gallery. "...Born with the not so appreciated label of Low Brow (to keep the distances from an art realized by and for an élite), Pop Surrealism makes us aware of a small but extremely significant revolution. It’s the artist himself (and the audience) that understands the reality in which we live in and gives us a new kind of imagery that appears as never seen before, but carries a deep link to our subconscious through the use of allegorical visions common to our collective brain." The Cake Lady Returns: New Work by Mary Lou Zelazny at Carl Hammer Gallery in Chicago, IL. "...The Cake Lady Returns’ primary subjects are nearly always females posturing ambiguously, almost supernaturally, standing powerfully yet motherly, softening and juxtaposing any context in which we see them. All the while that the focus seems to lead us in the direction of rethinking the clichés of romance, surrealism and pictorialism; Zelazny surreptitiously reveals herself afresh through a barrage of new and seemingly disparate images. Great satisfaction is derived in viewing these works when the perfect, unexpected visual element or lost piece of the puzzle is found and made to be a part of the greater whole. From the tension and movement of all of the elements, both visual and thematic, and in the complexity of their reassembly, we become enlightened by a realization of the artist’s vision and passion." More... Works by Mary Lou Zelazny at her personal site. Marcus Bleasdale at Anastasia Photo in New York. "...Marcus Bleasdale is one of the world’s leading documentary photographers and has been honored by Photo District News (PDN) as amongst the most iconic photographers of the 21st century. Once a prominent investment banker, Bleasdale swapped derivatives for a camera to document the horrors of war. Marcus has worked over ten years covering the conflict in the Democratic Republic of Congo. His work there has highlighted the reasons behind, and the devastating effects of, the conflict on the Congolese population." More... Works by Marcus Bleasdale at his personal site. Happy Birthday to my son Kyle - 14 years old today. 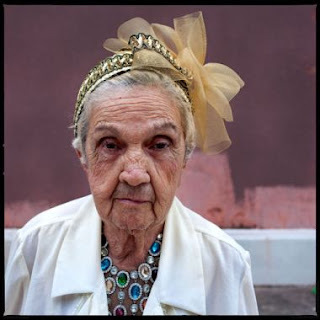 Jerry Siegel: Geraldine at Barbara Archer Gallery in Atlanta, GA. "...Alabama-based photographer Jerry Siegel explores identity and self-image in this compelling portrait series of Geraldine. Both artist and subject challenge the viewer to consider the choices we make in our appearance when we present ourselves to the world each day. In Geraldine's case, her persona is deliberately bold and fanciful, yet she remains undaunted by how others might perceive her." Talk to Me: Design and the Communication between People and Objects at MoMA. "...Talk to Me explores the communication between people and things. All objects contain information that goes well beyond their immediate use or appearance. In some cases, objects like cell phones and computers exist to provide us with access to complex systems and networks, behaving as gateways and interpreters. Whether openly and actively, or in subtle, subliminal ways, things talk to us, and designers help us develop and improvise the dialogue. Surfland - Photographs by Joni Sternbach. "...Surfland is an ongoing project of contemporary portraits of surfers created using the historic wet-plate collodion process. This very labor-intensive process has changed little since its invention in the 1850s. The photographs are a unique blending of subject matter and photographic technique. Part craft and part theatre, the instantaneous wet-plate collodion process allows Sternbach to create one-of-a-kind tintypes that are imbued with a feeling of ambiguity, timelessness and mystery." Drawing The Line: Japanese American Art, Design and Activism in Post-War Los Angeles at the Japanese American National Museum. "...A survey of the dynamic and diverse Japanese American contributions ot the visual landscape of L.A. in the period following World War II. Works of art and historic documents—together with texts, images, and video clips from extensive oral histories—will illustrate the delicate line that exists between form and function." Andy Warhol: Paintings from the 1970's at Skarstedt Gallery. "...Skarstedt Gallery is pleased to present a selection of paintings by Andy Warhol from the 1970’s. Despite the commerciality associated with some of Warhol’s works from the seventies, amassed in this show is a group of works which touch upon what Warhol did best, the abstract Oxidations and Shadows, and the iconic Ladies and Gentlemen, Mao and Russell Means." Lens Culture... L'Oeil Moderne - photographs by Edvard Munch. "...Like many of the painters in the beginning of the 20th century, Edvard Munch took photographs for inspiration. An essential part of a new traveling exhibition, Edvard Munch: The Modern Eye, deals with Munch's experimental photographic art. His photos are presented as independent works of art, together with the artist's experiments with film from the late 1920s." Light of Modernity in Buenos Aries, 1929-1954 at Nailya Alexander Gallery in New York. 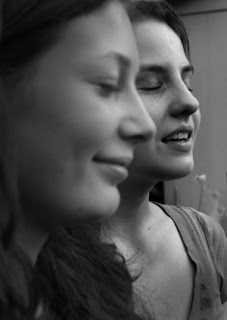 "...Modern photography emerged in Argentina between the 1930s and the early 1950s with the arrival of European artists. After emigrating from Berlin in 1926, Annemarie Heinrich initially worked as an assistant photographer, and in 1930, opened her own studio in Buenos Aires. Her world was theater, entertainment, cinema, and culture. Honing a version of glamour portraiture, Heinrich experimented with fragmentation and multiple exposures (Caprices Anita Grim, 1938) as well as the metaphors and optical games of surrealist inheritance (Self-portrait with Children, 1947)." GUTAI - Japanese Performance Art, 1956-1970 at UbuWeb Film & Video. "...'Gutai art does not alter matter; it gives matter life... In Gutai art, the human spirit and matter, opposed as they are, shake hands... My respect goes out to the works of Pollock and Mathieu. Their works are the cries uttered by matter: by oil paint and enamel themselves.' (Yoshihara, Gutai manifesto, 1956)." Creation Rebel... Chatti Mouth/Threat to Creation (1981, Statik Records – STAT LP4 .mp3 audio 07:44). Produced by Adrian Sherwood. Turn up the bass! Raymond Meeks... Abbey, Ann, 08.21.11 (2011, Gelatin silver print toned in selenium, Signed, titled, dated and editioned in pencil on verso). From the exhibition Raymond Meeks: Amwell | Continuum at Charles A. Hartman Fine Art. "...In evocative black and white and color images, Meeks explores ideas of home and stability against the backdrop of personal transition and larger socioeconomic upheaval. These quietly compelling, beautiful photographs of lost and troubled spaces, constant gardens, and portraits of his daughter, construct a narrative that posits a sense of loss while steadfastly asserting a belief in both resilience and hope. Meeks writes, 'I've believed it was important to have a strong sense of place, to identify 'home', even as for us, home, family and place are ideals which have taken on a relative meaning. I photograph close to home as memory loses structure, its architecture; trying to make light speak from the fixed edges of rooms long vanished.'" Sheying: Shades of China, 1850-1900 at Throckmorton Fine Art. "...The Forty photographs to be exhibited are part of a collection of seventy-nine works collected over several decades by Spencer Throckmorton. The images are all albumen prints; most measure six by nine inches. The photographs have recently returned from Spain, where they were exhibited to acclaim. A handsome book, in English, and edited by Clark Worswick, accompanied the exhibition of the photographs also entitled, Sheying: Shades of China 1850-1900. The exhibit includes photographs by the pre-eminent European photographers of China: John Thomson, Milton Miller, and Antonio Beato." Fluxus and the Essential Questions of Life at the Grey Art Gallery at NYU. "...A truly international network of artists, composers, and designers that developed in the 1960s, Fluxus resists categorization as an art movement, collective, or group. It also defies traditional geographical, chronological, and medium-based approaches. Rather, Fluxus participants embrace a 'do-it-yourself' mentality, fashioning their activities from quotidian experiences and blurring the boundaries between art and life. George Maciunas, Fluxus’s Lithuanian-born instigator, envisioned art as social process. He and other Fluxus artists created works that celebrate collaboration, the ephemeral, and the everyday—often inflected with a touch of playful anarchy. Aiming to circumvent both conventional aesthetics and the commercial art world, they urged both their colleagues and the public to approach life with a Fluxus attitude." Lens Culture... Ruined Polaroids - photographs and text by William Miller. "...These pictures are taken with a camera that is, by most definitions, broken: an old Polaroid SX-70 camera rescued from a yard sale. I've always loved this camera. It is an ingeniously conceived, complicated bundle of gears and switches with hundreds of moving parts packed in tight like a chrome and leather pistol." 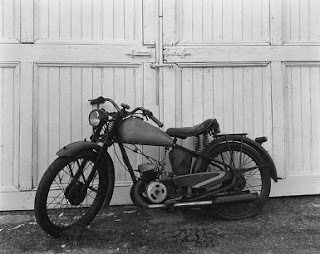 George Tice... James Dean's Motorcycle (Winslow Farm, Fairmount, IN, 1985). From the exhibition George Tice: Seldom Seen at Danziger Projects. The Civil War Sketches of Alexander Simplot at the WHS. "...If asked to picture a scene from the Civil War, most Americans would probably imagine an iconic black-and-white photograph by Matthew Brady. But during the war very few people were able to see photographs like those because printers had no way to include them in newspapers and magazines. Instead, Americans saw engravings of drawings made by artists in the field. Artists sent hand-drawn sketches from the front to be engraved line-by-line on metal plates, which could be printed on paper alongside text. Periodicals such as Frank Leslie's Illustrated Newspaper and Harper's Weekly brought thousands of Civil War scenes into American homes. This gallery features dozens of original drawings and sketches by one of those artists, Alexander Simplot (1837-1914), who worked as an illustrator for Harper's Weekly during the first half of the war."